Considering a test cell and a camera on the telescope. Then comparing the histogram of images. The better dynamic range (height) wins. However as I learned from DPAC, there’s a limited impact that quantitative testing has over subjective “tastes”. So am debating worth of it. Are you ready for the second installment of "bafflemania"? Lets go! Now that my favorite "test target" is baaack! This morning an opportunity for Jupiter GRS w/o the otherwise ever present jet stream presented itself. I now have a baseline with two control scopes. The key objective is to increase the quality of visual observing by changing the way baffles are done in an otherwise ideal (1/8th wave tested) sample. The ability to function close to that of an known good long achromat, in the form of useable focus in difficult conditions (low altitude) on known low contrast features (e.g. actual use case) is the prime objective. Secondary baffle’s wider, lower opening is 1.4” OD (0.042” thickness except with inside chamfer 0.160” long down to 0.30” thickness - mine has some flashing left on - appears to be a styrene plastic like the primary baffle). Top of baffle, where cemented to mirror is 1.25” OD. The baffle is 1.625” long. There is a bearing surface enlarged “land” against the mirror where glued to it. This ID is 1.090” and is the “stop” that determines the effective size of the secondary mirror. If one could “trim” the secondary mirror spot back and insure that the edge wasn’t specular (like with chemical milling) this would be the smallest CO possible. Both baffles came off by applying anhydrous isopropyl alcohol to the glue seam. The glue appears to be a clear film, which might be styrene model glue. Both plastic baffles have a smooth finish of medium gloss, and do reflect incident light well. Using the light bulb test, the upthread prototype cone did not pass light around the secondary, even when the corrector was at maximum extension (screw thread at/beyond stop). No telescopes were maimed in the making of this post. Kids, don’t try this at home. Proper mathematics and technique were employed before taking action, and an objective criteria to measure has been and will be used to gauge visual results as the scope would be used. Perhaps if it works out, it might be worth a DIY thread. But only if it works out well. Both baffles have been kept and the scope can be restored. Interim report is that on terrestrial targets it focuses more easily, and works at higher magnification. Storm is coming in, so this is all for about a week of wet. The primary baffle needs to be enlarged - it was too restrictive. Perhaps the CO was more like 45-50% on the unmodified C90. This will impact a lot on baffles and optical performance. So with the new baffle design, more of both of the mirrors surface is now being used. Does this change the DPAC any? And ... the best corrected BFL? So I DPAC’d quite a large number of times (while 3 inches of rain, a stiff southern wind, and after unplugging a downspout that indirectly flooded the laundry room...). 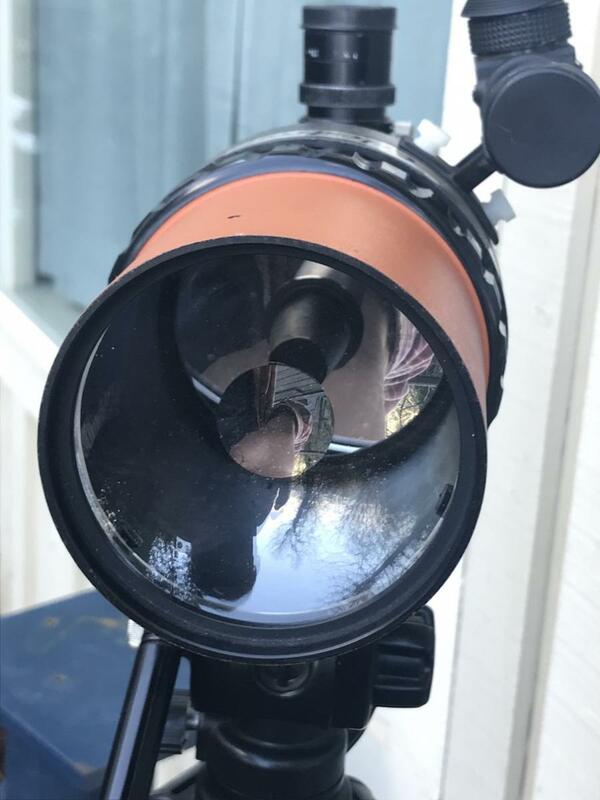 Best correction is with a BFL that coincides with at the top of a 1.25” Celestron prism diagonal with the 1.25” EP holder screw on sleeve (used to be about 0.5” above a 0.965 mirror diagonal). The lines are sharper, easier to DPAC. No turned edges or central holes. Going to have to check on vignetting. Break in the weather. Might see a crescent moon and some doubles before a solid week of wet stuff. Looks different from the front. Thinking of trimming down the spot by removing outer 2mm border. So more detail in terminator shadows, and I can now see in the C90 blue earth shine instead of just monochrome before. And there's about the same HSA. Perhaps if I bring CO down to SCT levels, HSA won't grow and I'll get better than SCT from this MCT. How far can I take that? Dunno. Add: Some improvement on uneven doubles in Orion. The first diffraction ring isn’t as bright. Although the residual lateral color slightly in/out of focus is more obvious. Spot on focus there’s none. Edited by wfj, 11 January 2019 - 01:38 AM. Picked up a C90 earlier this morning for $50 and I already love it. However, it is missing the original mount. Any recommendations on replacements? What do you all have your C90s mounted on? I want to keep it as original as possible, but I'm guessing it might be a bit cost-prohibitive to bring it entirely back up to spec. They were originally sold without a mount. There should be a litttle base plate on the bottom of it though. It is designed to screw on to a standard photo tripod. If you want to spend a little bit more money you can buy a more sturdy tripod designed for a telescope. Good to know! I've attempted to find a manual for it online, but to no avail so far. I see people with those gray tabletop mounts, is there a name/brand for them that you might recommend? That's a neat take. 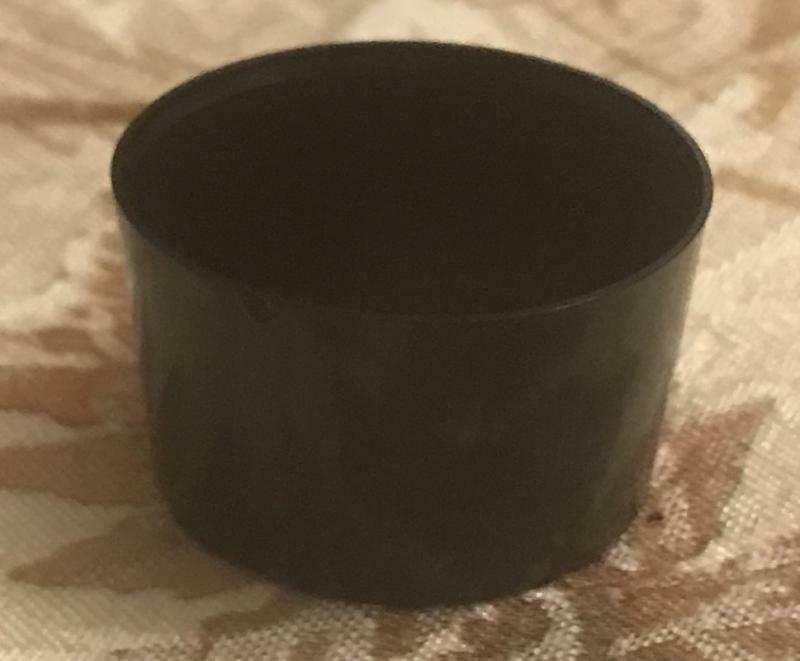 I'm trying to keep it as close to stock as I can - does anyone know where I might find a small mount like these? Also, are you guys using 0.965" EP or converted to a 1.25? Edited by RyanSem, 12 January 2019 - 04:05 PM. They were part of those telescopes. You need to look for an ‘Astro’ model. Aha, makes sense! I'll look for another solution then. Still undecided in the direction I'll take with mounting this. IMO they're not great mounts because they're effectively useless in EQ mode unless you have the wedge, which is very rare. 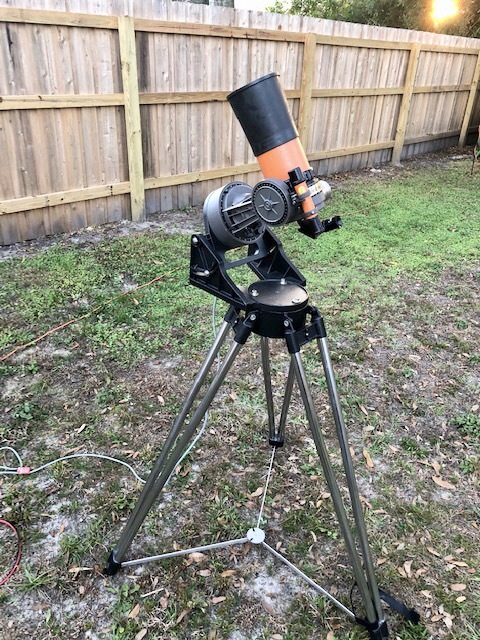 I just deforked mine for use in photographing the lunar eclipse next week and hopefully a launch or two from Florida next month. After spending the past hour and a half reading through this thread I am actually happy I stumbled across a spotter instead of an astro judging by the comments here. 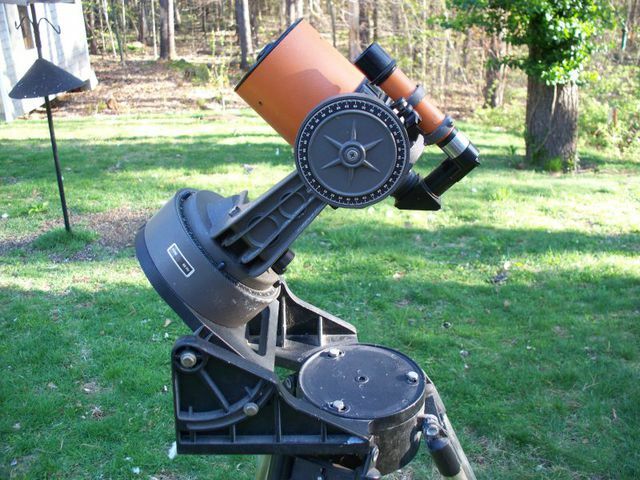 I had a spotter model that I used on a Manfrotto tripod with a Universal Astronomics Dwarfstar mount. Now I ended up buying an Astro model. True but they are small and light enough that it would be very easy to make an effective equatorial wedge. They work perfectly as a portable alt az mount without the wedge. Plus it’s just got all the cuteness. Did some daytime moon observing today while grilling. This thing sure is sharp. Hopefully I have a clear night. I really like my Astro. It's a complete compact package, but it has one problem. It's not 1.25" friendly because of the limited space when pointed near Polaris. As far as wedges, I'd think it would be easy to make or modify the tilt plate on a large base C5/C8 wedge. It's not 1.25" friendly because of the limited space when pointed near Polaris. I use a hybrid diagonal and don't have that problem. I have had probably four of these, and was disappointed in all of them with the optics. They would go to about 80X OK, but no further. So I would sell it, and read a forum from someone saying how good the optics was on theirs, so I would try another one, and the same thing. It took me about 2 or 3 more tries until I learned my lesson. I still see forums from owners saying how good the optics are on theirs. So I guess I just bought a bad one every time. 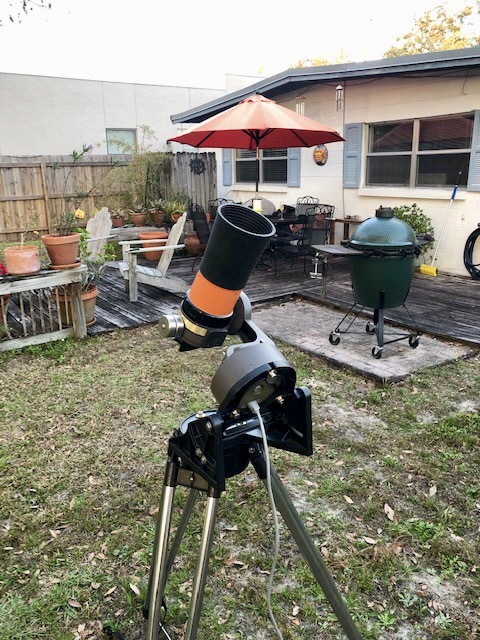 They are nice little scopes, and there are probably good ones out there, but the good ones will be kept, so getting a good one is a slim chance I think now. I figured that would work, but it appears it's hard to find the good ones these days. A .965" to 1.25" adapter came with my 1974 C5 last year. I haven't tried it, so not sure it will work. compared to what scope? you have to remember, these are not $2,000.00 scopes.